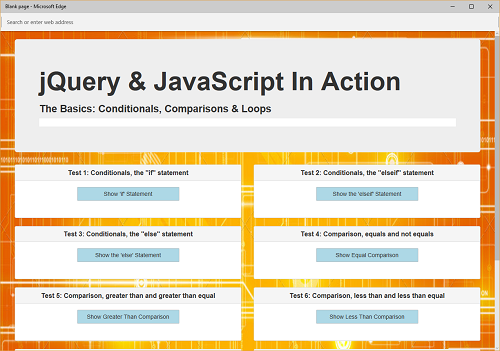 JS & jQuery Foundation: You will be introduced to the foundations of logical decision making in code using the "if" statement, "switch" statement, comparison operators and different looping techniques. You will construct a JSON object of food related information then loop through it using a FOR loop. In the process you will use an IF conditional statement and SWITCH conditional statement to construct the actual list of items shown on the screen.